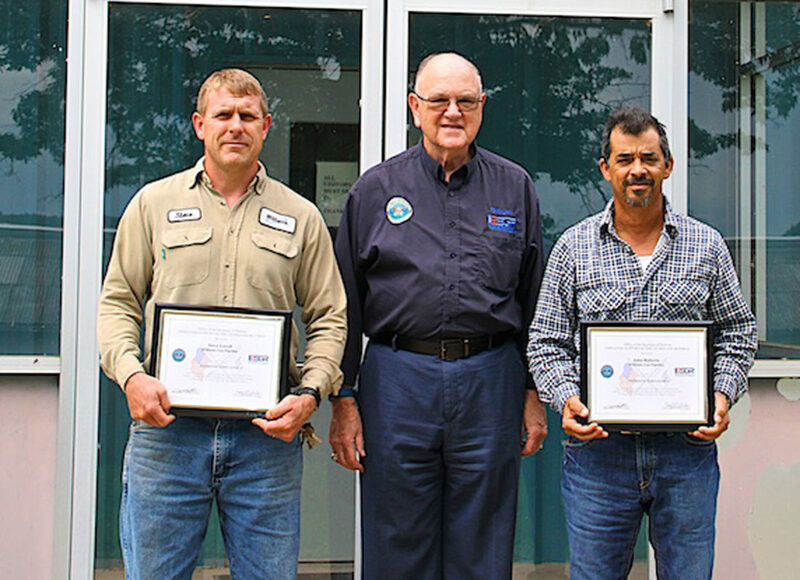 PHOTO PROVIDED Steve Lovell, left, and John Roberto received DoD Patriot Awards for their outstanding support of the Pennsylvania Guard and Reserve. William Burkhard, center, the North Central PA Chair of ESGR presented the awards on behalf of ESGR. JERSEY SHORE – John Roberto and Steve Lovell of Williams Gas Pipeline, Jersey Shore, were honored with a Patriot Award in recognition of extraordinary support of its employees serving in the Pennsylvania Guard and Reserve by Pennsylvania Employer Support of the Guard and Reserve (ESGR), a Department of Defense office. “The Patriot Award was created by ESGR to publicly recognize individuals who provide outstanding patriotic support and cooperation to their employees, who like the citizen warriors before them, have answered their nation’s call to serve, according to William Burkhard, ESGR Pennsylvania North Central Area chairman. Staff Sergeant (SSG) Curtis Twigg of the 252nd Engineering Company nominated Roberto and Lovell for the Patriot Award for being highly supportive of his military career. ESGR, a Department of Defense office, seeks to foster a culture in which all employers support and value the employment and military service of members of the National Guard and Reserve in the United States. ESGR facilitates and promotes a cooperative culture of employer support for National Guard and Reserve service by developing and advocating mutually beneficial initiatives, recognizing outstanding employer support, increasing awareness of applicable laws and policies, resolving potential conflicts between employers and their service members, and acting as the employers’ principal advocate within DoD. Paramount to ESGR’s mission is encouraging employment of Guardsmen and Reservists who bring integrity, global perspective and proven leadership to the civilian workforce.